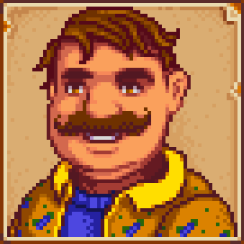 Folks 'round Stardew Valley don't want to cook for themselves all the time, and that's where Gus comes in. Owner of the Stardrop Saloon, Gus is responsible for serving all manner of tasty foods and beverages to his customers - and he always has customers. Yet the people of Pelican Town can only provide so much business, and even jovial Gus sometimes has trouble making ends meet. Gus lives at the Stardrop Saloon, and spends the majority of his days behind the desk, serving customers. He's an overall friendly guy, and, judging by one cut scene with Linus, a charitable spirit. He spends most of his days with Emily, his part-time waitress, and during festival days he's often paired with Pam, his most frequent customer. Gus' birthday is on the 8th of Summer. True to his line of work Gus is food-centric in his likes, and you'll get the best results by giving him a Fish Taco, Escargot, or plain 'ol Oranges. He also enjoys Pizza, Spaghetti, Parsnips, Sashimi, and, well, just about anything you can buy from the Stardrop Saloon. Gus is less inclined towards items plucked straight from nature, though he enjoys gems, valuing Diamonds above all others. With a few exceptions (like Parsnips and Potatoes) Gus isn't a massive fan of most greens, and he won't enjoy any fish you bring to him straight from the fishing rod. He also harbours an odd resentment towards Coleslaw, as well as a less-odd detestation for Joja Cola. Gus' schedule is fairly predictable, and he spends the majority of his days at the Stardrop Saloon, opening the restaurant at 12 pm and closing it at 12 am to go to bed. You'll find him manning the counter the whole day. He will occasionally head to Pierre's General Store early in the day, so it's worth popping inside to see if he's browsing the selection if you're in Pelican Town before 12 pm. At three hearts Gus will send you the recipe for Salmon Dinner in the mail. At four hearts you can get a scene between Gus and Pam if you arrive at the Saloon before Pam gets there, roughly before 5 pm each day. At five hearts Gus will send you the recipe for Cranberry Sauce in the mail.